Top: Saint Demetrius (4th C), Saint Eustace (3rd C), Saint Lawrence (3rd C). Bottom: Saint Gregory Thaumaturgus [ο θαμ] (3rd C), and Saint Cosmos & and Damian (3rd C). Right: Luke (though it looks like λουκλς rather than λοθκασ to me), Mark, Thomas, and Jacob. I'm totally lost in the center. I can pick out some words, but I can't tell if the top section should be "ιδιω υ ως σου ιδου η μιτιρς" or "ιδιω υ ιδου η ως σουμιτιρς" (or different word division since neither are making sense to me). Also shouldn't it be "τω θεω" and not "θεω τω"? NOTE: all the saint's feast days fall between Sept 20 and November 17 on the orthodox calendar. Demetrius is actually tomorrow. Makes one think this is a cover of a lectionary covering this period of time. My guess for the center was either ιδι ω υως σου [intended to be ιδε ο υιος σου] or ιδωυ ο υς σου [a misspelling of ιδου ο υιος σου, with ο and υ of ο υς being blended together accidentally] on the left side (indicating Jesus is speaking to Mary) and ιδου η μιτιρ σ [an orthographic variation and abbreviation of ιδου η μητηρ σου] on the right side (Jesus' words to John). If the first transcription for the left side is correct, then this image preserves the sequence ιδε ... ιδου in John 18:26-27, which is supported by many manuscripts in Family 35. Above Mary is her title θεωτωκ(ο)ς, while above John is Ηωανις (a curious spelling of his name). Notably, Matthew (in the left column) is spelled Ματθεος, as opposed to the Byzantine spelling Ματθαιος and the typical critical-edition spelling Μαθθαιος. Good thoughts. I think the ιδε ... ιδου combination (John 19.26-27) is interesting as noted above. The spelling is so bad as to suggest no substantial acquaintance with Greek, even on a piece like this - but that itself seems odd because why is the writing in Greek if the scribe/artist is so lacking (and why didn't they consult someone who knew Greek?)? It suggests (to me) that the words were not copied from a gospel text, maybe from some part of the liturgy??? There is more info on the artifact (actually a reliquary - for holding a piece of the true cross!) 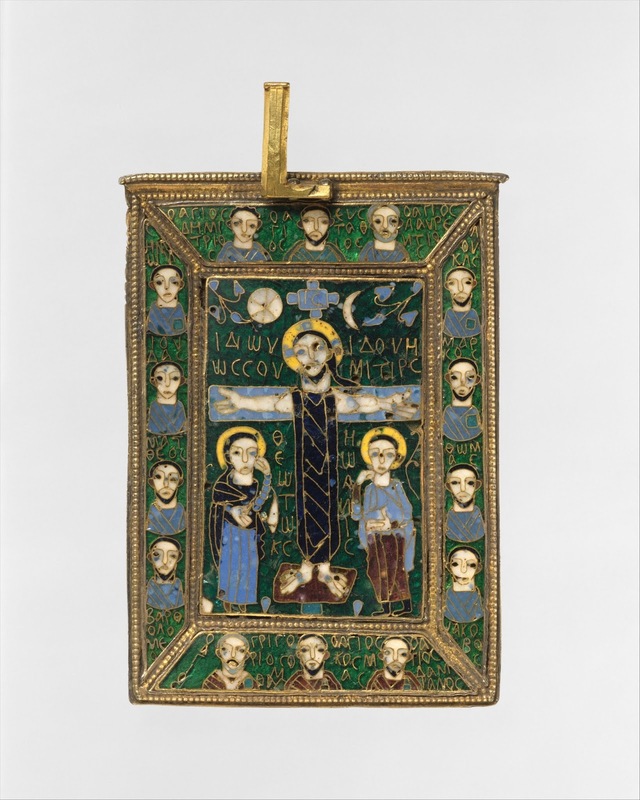 here: https://www.metmuseum.org/art/collection/search/472562 and https://en.wikipedia.org/wiki/Fieschi_Morgan_Staurotheke and I first read about it in K. Wessel, Byzantine Enamels from the 5th to the 13th century (ET; Shannon: Irish University Press, 1969), 42-44. If you explore the link that Peter Head provided, you can zoom in on the reliquary to see details of the inscription. And check out the side-views and the inside. Bob Relyea, I suggest "Simon," with sub-standard spelling (notice the small sigma), and then "Jude," rather than "our Jew." How did I miss parts 1-11? Oh, I see it now. Without the σημων rather than ημων. And without the pronoun, Jude is better than Jew. The link above include a full decryption of the inscriptions (which agrees with James here) without the commentary about their unusual spellings.